IBM Workplace Services Express is software that makes it simple for you, your colleagues, your teams, and your entire organization to quickly collaborate and effectively work together. Designed specifically for small and medium-sized organizations or departmental needs in larger organizations, Workplace Services Express enables you to easily create, edit, and share documents from your own customized Workplace environment. 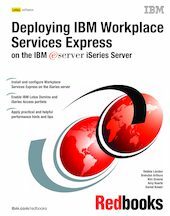 This IBM Redbooks publication is written for administrators who want to install, configure, and administer Workplace Services Express on an IBM eServer iSeries server. It introduces you to Workplace Services Express. It shows you how to deploy and customize it on the iSeries server, as well as how to integrate with an existing IBM Lotus Domino infrastructure. In addition, this book shows you how to integrate Domino mail and applications with a Workplace Services Express environment. It explains how to enable the iSeries Web Access portlets so you can work with your iSeries server from a Workplace Services Express environment. And this book provides information about performance tuning for Workplace Services Express on the iSeries server.